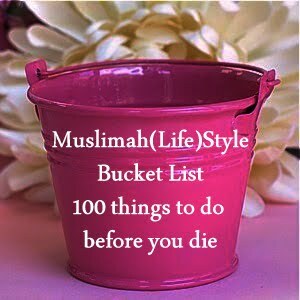 The only extensive Muslim Bucket list one the internet. All halaal. Be sure to offer suggestions to out list and in our comments section share the things that you have done. Pass on nuggets of knowledge – Teach somebody something, you’ll feel better for it. Learn something new daily – Seek knowledge from the cradle to the grave doesn’t get more current than that. Sit on a Camel / Donkey – Sunnah? Give ghusl to someone who has passed on. MashAllah, good list, I’ll be following this inshAllah! Shukran. Be sure to share your suggestions and progress too 🙂 Dropped by your site. Loving it. You’re welcome to share. Please link back to Muslimah(Life)Style – And Credit Hasina Suliman. I wanted to know what is “Haramain” ? Haramain refers to the grand mosques of makkah and madina respectively i.e Masjid-un-Nabawi & the Haram of Makkah. Masjid al Aqsa is referred to as the third Haram.